U-413 was a Type VIIC U-boat built for Nazi Germany's Kriegsmarine for service during World War II. She was commissioned in mid 1942, with Oberleutnant zur See Gustav Poel in command. Poel commanded her (receiving promotion to Kapitänleutnant), until 19 April 1944, when he was relieved by Oberleutnant zur See Dietrich Sachse who commanded her until her loss. U-413 was laid down on 25 April 1941 at the Danziger Werft (as yard number 114), launched on 15 January 1942 and commissioned on 3 June. She conducted eight patrols in World War II, sinking six ships totalling 37,985 gross register tons (GRT). German Type VIIC submarines were preceded by the shorter Type VIIB submarines. U-413 had a displacement of 769 tonnes (757 long tons) when at the surface and 871 tonnes (857 long tons) while submerged. She had a total length of 67.10 m (220 ft 2 in), a pressure hull length of 50.50 m (165 ft 8 in), a beam of 6.20 m (20 ft 4 in), a height of 9.60 m (31 ft 6 in), and a draught of 4.74 m (15 ft 7 in). The submarine was powered by two Germaniawerft F46 four-stroke, six-cylinder supercharged diesel engines producing a total of 2,800 to 3,200 metric horsepower (2,060 to 2,350 kW; 2,760 to 3,160 shp) for use while surfaced, two Siemens-Schuckert GU 343/38–8 double-acting electric motors producing a total of 750 metric horsepower (550 kW; 740 shp) for use while submerged. She had two shafts and two 1.23 m (4 ft) propellers. The boat was capable of operating at depths of up to 230 metres (750 ft). The submarine had a maximum surface speed of 17.7 knots (32.8 km/h; 20.4 mph) and a maximum submerged speed of 7.6 knots (14.1 km/h; 8.7 mph). When submerged, the boat could operate for 80 nautical miles (150 km; 92 mi) at 4 knots (7.4 km/h; 4.6 mph); when surfaced, she could travel 8,500 nautical miles (15,700 km; 9,800 mi) at 10 knots (19 km/h; 12 mph). U-413 was fitted with five 53.3 cm (21 in) torpedo tubes (four fitted at the bow and one at the stern), fourteen torpedoes, one 8.8 cm (3.46 in) SK C/35 naval gun, 220 rounds, and one 2 cm (0.79 in) C/30 anti-aircraft gun. The boat had a complement of between forty-four and sixty. The U-boat departed Kiel on 22 October 1942, on her first patrol. 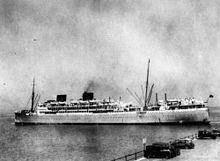 On 14 November 1942, she sank the 20,107-ton troop transport ship MV Warwick Castle (one of the largest sunk in World War II). At 08:44, the ship, under the command of Henry Richard Leepman-Shaw in Convoy MKF-1X was hit by one of two torpedoes fired, about 200 nautical miles (370 km; 230 mi) NW of Cape Espichel, Portugal. The U-boat hit her again at 08:57, causing the ship to sink about one hour later. The master, 61 crew members and 34 service personnel died. 201 crew members, 29 gunners and five naval and 131 service personnel were rescued by HMS Achates, HMS Vansittart, HMCS Louisburg, and the British MV Leinster. The latter ship had been in Convoy KMF-1 for Operation Torch (the invasion of North Africa). On 19 November 1942, U-413 was attacked by a British Lockheed Hudson aircraft with five bombs and was damaged so severely that she had to return to a new base - Brest in occupied France. Her second patrol was marked by sinking the American ship West Portal in mid-Atlantic on 5 February 1943; there were no survivors. She also attacked and sank the Greek Mount Mycale on 22 January 1943, northeast of Newfoundland. Her third patrol saw her leave Brest on 29 March 1943, once more for the Atlantic. There, she sank the British vessel Wanstead south of Greenland, whose survivors were picked up by the corvette HMS Poppy and the ASW (anti-submarine warfare) HMS Northern Gift. Her fourth sortie was a frustrating one; it was split into three parts, but she failed to sink any ships. On 20 February 1944, she sank the British 1,100 ton destroyer HMS Warwick about 15 miles off Trevose Head, north Cornwall. This was Poel's last patrol. He moved to the Naval Academy Mürwik in Flensburg. Her last victory was when she sank Saint Enogat on 19 August 1944 in the English Channel. U-413 did not suffer any casualties until 20 August 1944, when she was sunk, by one of the 115 strategically placed Naval Mines in the Cornish corridor 15 miles off the coast from Padstow. 45 of her crew were killed; there was one survivor. The wreck of U-413 was located and identified by marine archaeologist Innes McCartney in 2000 close to the official sinking position. U-413 took part in 15 wolfpacks, namely. Neal Stephenson's novel Cryptonomicon features a fictitious U-413, a milchkuh (supply boat). ^ Kemp 1999, p. 212. Edwards, Bernard (1996). Dönitz and the Wolf Packs - The U-boats at War. Cassell Military Classics. p. 145. ISBN 0-304-35203-9. Helgason, Guðmundur. "The Type VIIC boat U-413". German U-boats of WWII - uboat.net. Retrieved 26 December 2014. This page was last edited on 21 February 2019, at 22:18 (UTC).